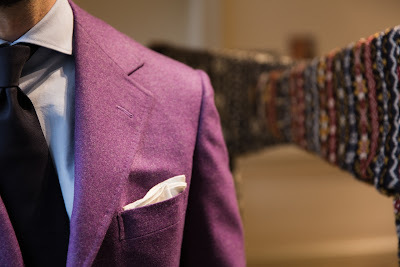 This is a jacket from Liverano & Liverano, Florence. Readers of the Armoury’s excellent Tumblr account will be familiar with various Liverano jackets, but this was my first experience of the Liverano cut. 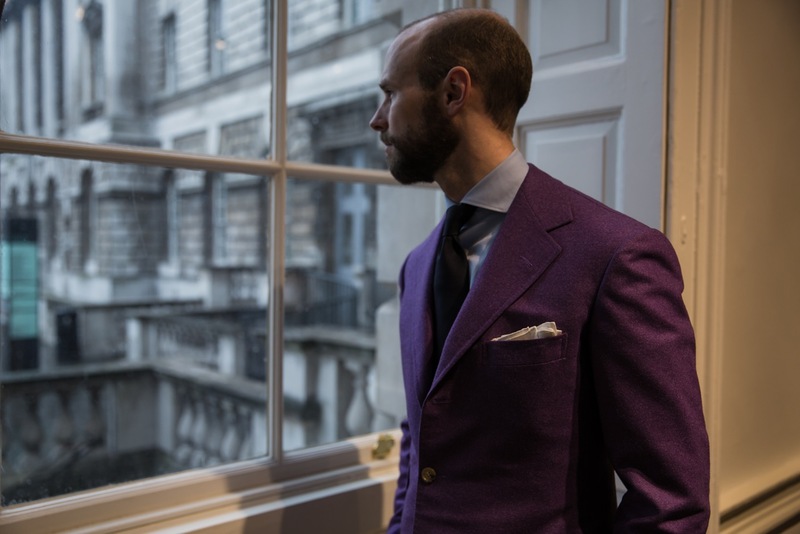 Although it has many things in common with other north Italian tailoring, such as the construction that sits squarely between Savile Row and Naples, and the former’s traditional shoulder and seams, Liverano is also noticeably different in a few areas. The jacket tends to be cut rather short, with most of the length coming off the skirt rather than the chest. The sleeve is narrow and the chest cut quite close. The overall result is a jacket that looks quite contemporary, and this is at least one reason it has become popular. Antonio Liverano also has a wonderful eye for colour, which he will deny with a wide, modest smile, but then throw on a pastel pink scarf with a doughnut pattern that he designed himself. It was that eye that convinced me to go with this rather strong shade of purple, in a vintage woolen cloth from among his collection. Those that have come along to the Armoury’s trunk shows in London or been to the Liverano shop in Florence will be familiar with Antonio’s homemade swatch books. The fit was faultless, as you might expect, and the overall look of the finished garment was dressier than I expected. Even at the forward fitting I anticipated a rather casual piece that I would wear with jeans, but the sharp finish and bright horn button make it more akin to a blazer, albeit in a rather unusual tone. Liverano is expensive, which I can’t account for, but the style in both cut and cloth is unique – and that’s pretty rare among Italian tailors. You can follow the discussion on Liverano & Liverano jacket by entering your email address in the box below. You will then receive an email every time a new comment is added. These will also contain a link to a page where you can stop the alerts, and remove all of your related data from the site. Bravo. Wonderful colour and cut! That is an exceptional jacket, to take such a forward colour and still make it that look so sharp, and more importantly – wearable is a testament to the skill of the tailor. Slim sleeves and short skirt would always be my choice if I could go bespoke. Wonderful jacket, congratulations! I am going to Florence myself end of May to pick up my first commission with Liverano and for forward fittings of a couple of pieces. They have been a pleasure to deal with, very professional (as expected at this price point obviously). Having been a fan of The Armoury for some time now, i have been aquainted with Liverano and Liverano for the same period. I must agree that his eye for colour is excellent. So to the jacket. Not a colour one would normally chose but having said that, it looks simply stunning. Pity there are no good photographs of it rather than the ‘magazine style shot’ which i understand looks nice for you but does nothing do the clothing any justice. Something you may have noticed recently in the Rake magazine? The shots are so dark on some of the models that quite frankly they could be wearing something totally different to what is being advertised. Why cant we just have simple, good photography – everything has to be overdone to the extent that the real purpose of the photograph becomes obsolete! Quel moderne et élégant costume! what kind of cloth is that simon? Did you consider going for the full purple suit? Now that would be bold! Beautiful colour! Have you ever come across Sartoria Seminara in Florence? I’ve become a client a couple of years ago. The style is something halfway between Milan and Naples. Everything is hand made and from what I know prices are slightly cheaper than Liverano. Gianni Seminara (owner) would also be glad to fly to London to find some new clients. Would you mind having a look? From all the posts in which I’ve seen you wearing some freshly made jacket, it’s by far the best result. This jacket is absolutely outstanding. It’s certainly a very bold colour, if not my cup of tea. Though I admire your audacity and the fit looks wonderful from what I can tell. I am in love with the Solito from the previous post and look forward to seeing the other two. please do keep up the good work i thoroughly enjoy skiving in the office perusing your posts. A beautiful jacket in a wonderful colour, but what is the wrinkling of the fabric just above the breast pocket? Might one enquire as to the price? Is this jacket a bespoke one or a ready to wear? is that for a suit or just the jacket simon? Oh god, just the jacket! Do they visit the US? Not at the moment, but The Armoury is opening a branch in New York in December, and Liverano will be visiting there in the New Year. Does Liverano & Liverano only serve their existing bespoke customers on their overseas trunk shows? Hello Mr Crompton, would you say that the construction and finishing is comparable to your Cifonelli coat? You seem like Cifonelli very much. Does Cifonelli has the highest quality as same as the Row? Compare with Rubinacci and based on their quality, which brand you think is better ? I am also curious about why Italian tailor prefer vantage cloth, only because these cloth expensive or rare? Liverano is a better finish, but the ‘quality’ in the broadest sense is very similar. Particularly worth having a fitting in Naples with Rubinacci, at least on the first jacket. Liverano is known for the “Florence” cut…. Are there other florentine tailors you know of, without the ‘brand’ and could recommend who do a similar cut but at a lesser price? I know there are a few tailoring shops in Florence of course but it’s difficult to take the leap with something that is otherwise entirely unknown. I should add that I am not someone who is particularly bothered about button hole hand finishing etc as long as the end fit is excellent. I know one or two, J, but they are old guys working on their own that don’t really take on new customers. I am in Florence in a few weeks too (for Pitti like you I guess) so if I bump into you there will make sure to say hello. Replying to an old post here. Great piece! At the moment I’m a patron of Savile Row but it is clear from your blog that there are some very good tailors in Italy and Paris. I would love to try out some of them but it looks like many of them don’t travel to London. In your view, which are the (really) good tailors who travel to London? I’ve ordered some shirts from L. Avitabile (where I bumped into you, actually) but I haven’t ordered any suits or jackets yet. He made you a beautiful jacket. I also commisioned a sport jacket with 2 matching pants . The results came amazing…very elegant but at the same time relaxed feeling. Mr Liverano is very charming person and truly has an eye on colour.